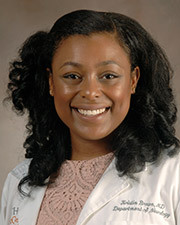 Kristin Brown, MD, received her undergraduate and medical degrees from State University of New York at Stony Brook, where she also completed an internal medicine internship. Dr. Brown went on to complete fellowships in stroke prevention, neurophysiology and neurology as well as her residency at McGovern Medical School at The University of Texas Health Science Center at Houston. Board certified in neurology, Dr. Brown specializes in neurology and clinical neurophysiology. She is a National Institutes of Health StrokeNet Fellow and a staff physician at McGovern Medical School. Dr. Brown is affiliated with Memorial Hermann-Texas Medical Center and sees patients at UT Physicians Neurology – Texas Medical Center and UT Physicians at Sienna Village in Missouri City, Texas. A recipient of multiple awards, Dr. Brown has presented at events hosted by the American Heart Association, the Texas Neurological Society and other medical organizations.